We recently held a workshop here in Sioux Lookout where we created a piece entitled Wall Drawing #797 inspired by Sol Lewitt. Lewitt was an American Conceptual artist famous for his instructionals, among other things. In this set of instruction, the first artist draws an irregular horizontal line and the other artists copy the line without touching it will the bottom of the wall is reached, or in our case, the bottom of the strip of paper. 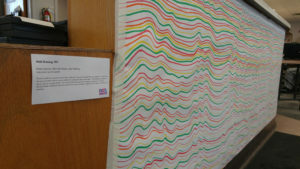 Lewitt nicknamed this piece “Copied Lines” and created it with students in mind. Forcing them to copy each other raises questions about artistic authorship and originality. We documented our process with the Gopro. 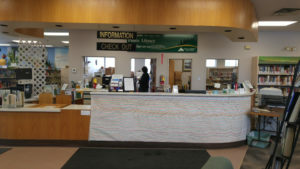 If you’d like to see it in person, it’s currently displayed on the front of the Circulation Desk at the Sioux Lookout Public Library.